Calling ALL sports start ups. Do you have the next big thing since sliced bread? Are you looking for validation of your idea from those within the sports industry? Then look no further. At the First Annual Global Sports Symposium, there is a dedicated Start Up Pitch Competition. This gives students and professionals the opportunity to showcase your idea to sports industry professionals. It’s free to enter, you just need the problem you are solving and your strategy for success. If you are ready to get your start-up the attention it needs to make your ideas a reality, submit an application to the GSS Pitch Competition by 22 April, 2014 telling us about yourself, the problem you are attacking and your strategy for success. The Big Question: Do you want another meeting? The Global Sports Symposium is the first annual student-run conference presented by the team behind the Ivy Sports Symposium (Sports Symposium, Inc.). Established in 2006, Sports Symposium, Inc. is a student-run, non-profit organization that sets the standard for sports business education. For the past eight years the Symposium has rotated among Ivy League campuses in the United States and has featured more than 300 unique speakers from around the world representing all facets of the business of sport. This will be the first year that the Symposium is held outside of the United States, taking place at Emirates Stadium in London on May 15th, 2014. 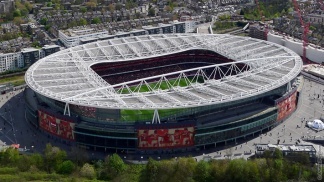 Emirates Stadium, home of Arsenal Football Club. Sports Techie, Best of luck to those of you who enter to win or simply want the exposure and experience of going through the initial GSS Pitch Competition process. My free advise to the GSS for next year is to create a virtual pitch for a select few who cannot afford to fly to Europe and stay in a UK hotel. I am not sure whether any NDA’s are signed but do look into this before entering too many details about your hard-earned and well thought out business plans to shake up the sports tech Industry with your new System, Solution or App. I am sure the GSS Ivy League principles are standup people but giving away your sports technology trade secrets is a serious commitment for any founder or executive management team to make. Contact charlottejmales@gmail.com with any GSS and Start Up Pitch Competition questions. If you want my personal perspective on your sports technology entry or product that will revolutionize the world, or at least be useful to fellow Sports Techie community members, please contact me via any one of our social media network links below. It will be my pleasure to assist.